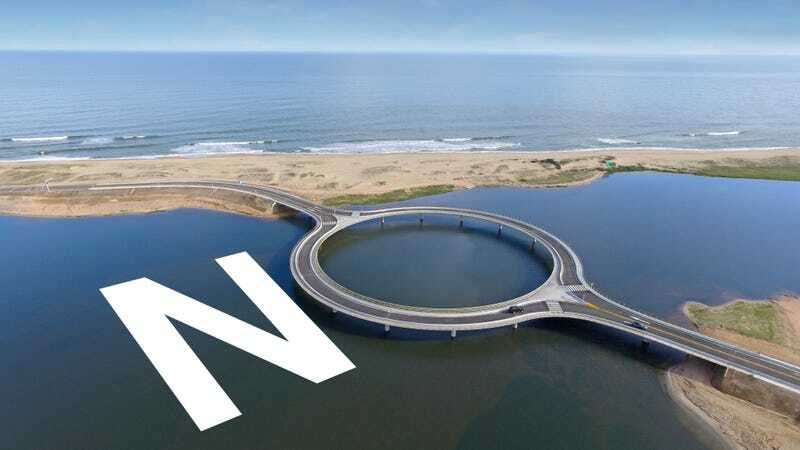 This is the circle-shaped Laguna Garzón bridge in Uruguay, and it is dumb. It was built for dumb reasons, too. They make sense, but are also dumb. The bridge is not insulting. It’s not controversial. It’s not horrible. It’s just kinda dumb. According to TechInsider, the new bridge was constructed to link the counties of Rocha and Maldonado, and to serve the local lagoon shoreline which is under new development. It’s expected to bring in tourists and serve as the cultural centerpiece to the developing area, with the bridge acting as an observation and fishing deck. Oh yea, it’s supposed to be a roadway bridge, too. The two main reasons the bridge is a circle and not just a straight road is to 1. aid motorists across the lagoon and look good doing it, and 2. slow said motorists down. There’s nothing in that circle. There are no plans for some pretty sculpture, no endangered reef ecosystem in that one spot to avoid and protect (that we know of), and you can’t even see the circle from space! The bridge is a circle to look cool and slow people down because the developer claims straight bridges are dangerous, going for long stretches that cause people to speed across them. Riiiiiiight. Those roads look pretty circle-less and straight to me. Do people not speed on those roads? Look, if you just wanted a cool bridge in the shape of a circle, which is more complex and distracting than it needs to be, that’s fine. I actually like the idea of it being the centerpiece to a culturally significant area they look to develop. But curving it as a solution for speeders? As my civil engineer roommate pointed out, speed bumps are a great cheap and effective way to slow people down. Also, if there’s a serious accident in the bend of the bridge—which is two one-way, single lanes in the “circle”—everybody is fucked. Anyway, it’s not the worst thing to ever happen, but it’s all kind of dumb to me. Let it be known that not all of the Jalopnik staff agreed. But to back me up, the bridge was designed by the same Rafael Viñoly Architects firm building that dumb new NYC skyscraper that looks like it was inspired by graph paper rather than designed on graph paper. This is the same firm responsible for the “death ray” London skyscraper, too. This design firm is getting big bucks off of the simplest ideas, and I’m just sitting here complaining about it. Maybe I’ll invent a keyboard with circle keys, or something.